ASUS will soon debut its ROG Matrix graphics cards - these new video cards will feature a dedicated overclocking chip. The ASUS Syper Hybrid Engine chip allows automatic detection and adjustment of memory/GPU voltage and fan speed. The chip saves power in 2D mode, boosts performance in 3D mode and enables you to monitor your graphics card more closely. As we mentioned in our initial report, the new Matrix graphics cards are equipped with additional controller chips on the PCB which Asus calls Super Hybrid Engine, and that allow users to increase the voltage to both the GPU core and memory. This is highlighted in the new slides from Asus showing a simple interface with slider bars adjusting core, memory and shader clock speed and voltages. The Super Hybrid Engine chips also allow for increased monitoring of the graphics cards including GPU, memory, PCI-E 3.3v and 12v, additional temperature readings and even independent power consumption of the GPU, memory and PCB. Power usage and performance are big features on the Matrix graphics cards. In 2D mode using a GeForce 9600 GT, Asus claim power usage is 26% lower than a standard model. 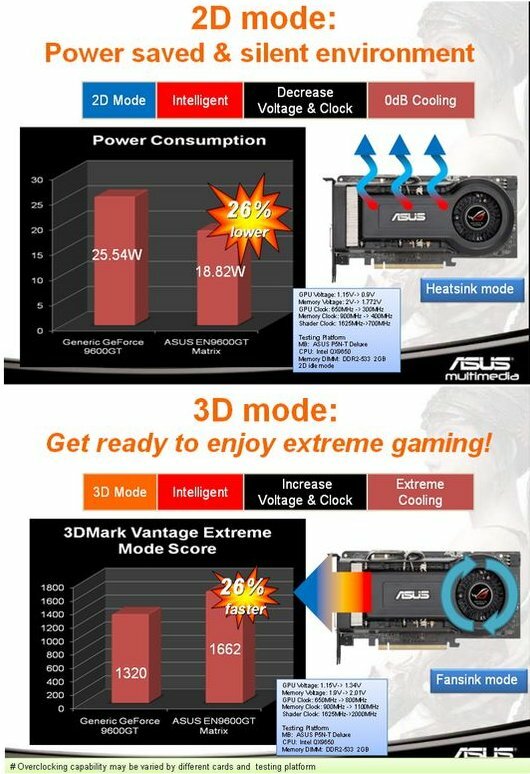 Asus also says overclocking headroom provided by the Hybrid Cooler and Super Hybrid Engine means that performance can be increased by up to 26% over a standard 9600 GT. Another interesting feature is the way the fan is controlled: normally this is set in relation to the GPU temperature but the Matrix graphics cards will use the work load of the GPU to determine the required fan speed. More slides and information at CustomPC.